What if you had a personal assistant that could guide you through particulars of obfuscation? Eazfuscator.NET extension for Visual Studio was made with performance in mind. For example, it is activated for obfuscated projects only and never looks at the projects which do not use Eazfuscator.NET. Moreover, it uses only the most efficient data structures, code and algorithms to make your work productive and pleasant. The presence of Visual Studio extension does not affect the core obfuscation. It works fine with or without the extension. 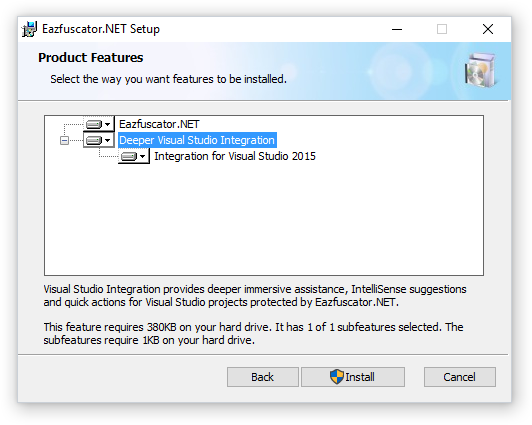 Eazfuscator.NET extension for Visual Studio has a minimum requirement of Visual Studio 2015. It does not work with older Visual Studio versions. Download Eazfuscator.NET now and find out yourself how much easier obfuscation can be when Eazfuscator.NET has a deeper Visual Studio integration. Software engineer, hardware hobbyist and zen simplicity adept. Working hard to bring analogue warmth and human touch to digital software. All content copyright Gapotchenko Blog © 2019 • All rights reserved.